This website is devoted Capt. Herbert C. Crosby, MIA Vietnam 10 January 1970. His remains were repatriated in 1989, with positive identification in 2006. His remains were laid to rest in Arlington National Cemetery on May 25, 2007 with full military honors, including a three helicopter fly-over. Here you will find the analysis information, along with stories, photos, videos of events that led up to the burial. You will also find extraordinary post burial events that keep his name and his story alive. You were never forgotten, and you live on in the hearts of us all. If you wore a POW/MIA bracelet with Capt. Crosby’s name on it and would like to return it, leave us a message on the Bracelets page. The Department of Defense POW/Missing Personnel Office (DPMO) announced December 19, 2006 that the remains of three U.S. servicemen, missing in action from the Vietnam War, have been identified and returned to their families for burial with full military honors.They are Capt. Herbert C. Crosby, of Donalsonville, Ga., Sgt. 1st Class Wayne C. Allen, of Tewksbury, Mass., and Sgt. 1st Class Francis G. Graziosi, of Rochester, N.Y., all U.S. Army. On Jan. 10, 1970, these men were returning to their base at Chu Lai, South Vietnam aboard a UH-1C Huey helicopter. Due to bad weather, their helicopter went down over Quang Nam Province. A search was initiated for the crew, but no sign of the helicopter or crew was spotted.In 1989, the Socialist Republic of Vietnam (S.R.V.) gave to U.S. specialists 25 boxes containing the remains of the U.S. servicemen related to this incident. Later that year, additional remains and Crosby’s identification tag were obtained from a Vietnamese refugee.Between 1993 and 1999, joint U.S./S.R.V. teams, led by the Joint POW/MIA Accounting Command (JPAC), conducted three investigations in Ho Chi Minh City and two investigations in Quang Nam-Da Nang Province (formerly Quang Nam Province). A Vietnamese informant in Ho Chi Minh City told the team he knew where the remains of as many as nine American servicemen were buried. He agreed to lead the team to the burial site. In 1994, the team excavated the site and recovered a metal box and several bags containing human remains, including those of these three soldiers.Among other forensic identification tools and circumstantial evidence, scientists from JPAC and the Armed Forces DNA Identification Laboratory also used mitochondrial DNA and dental comparisons in the identification of the remains. In the summer of 2001, I was 13 and took a business trip with my father to Hot Springs,VA. On our way we stopped in Indiana where my grandparents are from and live to visit for a couple days and then continue onto Virginia. We arrived to the job site and it wasn’t ready for the equipment to be installed and the Contractor insisted for a few more days. My father immediately told me this was a great opportunity to visit D.C and to see the Vietnam wall as well as the other monuments. That trip just me and my dad was one of the best few days of my life. While visiting the Vietnam wall I learned about POW/MIA bracelets. Since I’ve always loved my great state of Oklahoma I knew I had to have a bracelet from Oklahoma. We searched and searched for a bracelet. When I found Capt. Herbert C. Crosby. The biography for him said he was from Indiana and stationed out of FT Sill, OK. He was born in the same month as I was (may). When. I picked that bracelet up I felt humbled. And with all the connections i knew it was the one. Immediately after we bought it i wore it. I also had to have the rubbing of Capt. Crosby’s name off the wall. It was a real life experience for me and showed me a lot about our heros. I wore the bracelet for many years. Through my teenage years. I only placed it in a safe spot because I always knew it was something dear to me. The scuff marks on it now are memories of my teenage years. It is still one of my most prized positions. it’s one thing I’ve always held on to. We live in Moore,OK and on May 20,2013 it rode out an F5 tornado. I pulled it out tonight and wore it for a while and told my wife and daughter about it and read his bio to them and I decided to Google Capt. Crosby and found your website. Your brother has became part of my family and the bracelet I wear for him means so much. I’m glad he is resting back home. I plan to take my children to Arlington to visit him and tell them about our nation’s heros. Thank you from the bottom of my heart for your sacrifice Capt Crosby and thank you Mrs. Wade for the lovely website and the information. You brought wonderful tears to my eyes as I read your story Lee. Goosebumps and chills, too. Thank you (and your family) so much for caring and supporting our military,POWs and MIAs. We have many still missing, which makes my heart ache, but to know we have so many people who care is extraordinary. Don’t know if you read my brother’s letter home from Vietnam on his birthday in 1969, but he wrote that he hoped if he died, not making it home, that his duty was not in vain. That is my mission, to let him know he did not die in vain. Hence, the scholarship in his name and honor with the Army ROTC at Embry Riddle Aeronautical University. These young men and women are our future, and it is very bright with them at the helm. A lot of good things have come about due to his tragic loss in war. The scholarship yes, but also for me, I am now personal friends with many of his Summer ’69 comrades. I lost one brother, but gained a whole Company and Battalion of brothers. I’m a member of their Association (Rattler-Firebird.org). The Association meets twice a year (reunion). Nothing better than being among helicopter pilots from Vietnam, and especially ones that knew and flew with my brother. Amazing for me. Special thank you to your grandfather, he knows the pain everyone went through, and the struggles today. He’s a hero. Prayers for safety in this crazy weather world we live in. Thank you so much Lee. Herby would have been in awe of the attention he has received, and humbled beyond belief. I know I am. Thank you for remembering my brother, and for getting a bracelet in the first place years ago. I couldn’t believe the response our family received from people who had bracelets after Herby’s remains were identified. We had no idea over the years how many people had a bracelet. who cared, not only for my bother but for all the POW?MIAs. Beautiful. My family lived in Donalsonville from 1961 until 1966 and I attended school there through second grade. My parents knew Herb and also Mike Bowen, who was KIA on 31 January, 1968. Donalsonville is such a small community and every loss is personal on some level. Although I was a child during the Vietnam War, it is a central truth to my youth. I knew Mike because my mother tutored him in algebra when he was in high school. Although I did not know Herb, that does not lessen my respect for him and his service. Seminole County, Ga., lost 10 young men in Vietnam. At that time the county had a population of only about 5,500. My closest friend today is a Vietnam veteran who flew a Loach in the 1st Cav. He was shot down and seriously wounded in September 1970. His neighbor also is a Vietnam veteran who flew Hueys in the war. I told them about Herb, and both consider him as a brother. The bond these men share with their fellow pilots is incredibly deep. I will be in Washington, D.C., in February 2018 and will visit the Wall to pay my respects to Herb and Mike. Thank you for your comment, and for remembering not only Herby, but the tragic loss of young men from Seminole County. My father made sure these men were honored by working to have a monument installed in front of the court house for them. Every Memorial Day we’d put flowers in the church which would then be taken to that monument for the Memorial Day ceremony. Our family was lucky in regard to getting remains (teeth and bone shards) identified. I was so glad mom was still alive to experience that bittersweet time. I am now friends with Herby’s comrades, and have found the brotherhood the Vietnam Veterans have. I lost one brother, yet gained a whole helicopter assault company of brothers who took me under their wings. Mike was one of Herby’s best friends, also one of the reasons he enlisted in the Army in 1966. Thank you so much for your kind and thoughtful words. You’ll find his name on panel 14W/line 22 on The Wall. I paid my respects at The Wall on Feb. 23 and had the opportunity to share the experience with a group of my students from Bayshore High School in Bradenton, FL. The students conducted themselves with the utmost respect and asked many questions about the Vietnam War. I explained the personal connection my family has to the war, because the names on The Wall have faces attached to them. I pointed out the names of Herby and Mike Bowen, telling the students that these were young men whom my family knew. I mentioned the enormous losses the families of tiny Seminole County, Ga., suffered during the Vietnam War. I left Mike’s Silver Star citation at The Wall and chatted with a couple of ‘Nam vets. They asked who I had come to “visit,” and when I told them they repeated Herby’s and Mike’s names. They were genuinely interested in learning how I knew Herby and Mike. It did not escape me that the visit was a little more than 50 years to the day from Mike’s death. There is irony and a certain melancholy that 2 friends from Donalsonville, Ga., are forever linked on The Wall. My mother, who last saw your brother more than 50 years ago, had many questions about The Wall and your brother’s place on it. Rest assured, Mrs. Wade, Herby is not forgotten. I consider it a privilege to have shared that time in Washington with my students and to tell them a bit about the 58,000+ names on The Wall. I don’t know why email was kicked back but it is a new email. I was laying flowers at a grave at Arlington National Cemetery a couple of months ago when I noticed that the wind was blowing a piece of paper skipping towards me through the tombstones. The paper was a photo of Herb Crosby. It started to rain so I took the photo home with me, thinking I would find out where his stone was located and then return the photo to its resting place. The name was familiar to me. I worked at DPMO for several years and I remembered the name from documents I had worked there. The next time I went to Arlington, I placed the photo and flowers at his grave. I belong to Rolling Thunder (Virginia Chapter 3). We have had the honor of escorting former POW-MIAs to their final resting place at Arlington. I visit those graves on a regular basis and have taken the liberty of adding Herb Crosby to that list. I try to change the flowers every month. Your website gave me the opportunity to let you know that Herb Crosby is not forgotten. Thank you so much for your words, and for your caring, for being a part of it all. Whenever I go to Arlington I always take a new photo card to leave at my brother’s grave. It has all the pertinent information about him so someone can put a face with the etched name on the grave marker. I tuck it in as best I can so it won’t blow away. I usually attend the Wreaths Across America event in December so I place the photo card in the wreath. However, whoever picks up the wreath in the clean up process most usually tucks the photo card in next to the grave marker too. I’ve had family and friends visit his grave months later, and the card is still there. I won’t be there this December as I was there on Memorial Day (Herby’s birthday). I had the honor to ride with the Rolling Thunder (thanks to RT Reggie Lord) in your demonstration ride. This was a bucket list event for me. It was Herby’s 10th anniversary of burial, and would have been his 70th birthday. I rode close to the front of the pack with RT and Gold Star families and had the time of my life. Even the rain made no difference to me. Over the years of his missing I got to know many from the DPMO office, and CILHI team in Hawaii as I attended most all meetings. Everyone was so helpful. I am now a member of the Support Committee for the new Cape Canaveral National Cemetery here in Brevard County, Florida. My way to give back to all those who gave me, and still give me freedom. I’m this year’s chair for the Memorial Day observance, and honored to do what I can. I would love to meet you some time when I’m in DC at Arlington. I have a friend who was in the National RT Chapter 3 (but is now retired), and you all were at my brother’s funeral, which was videotaped. 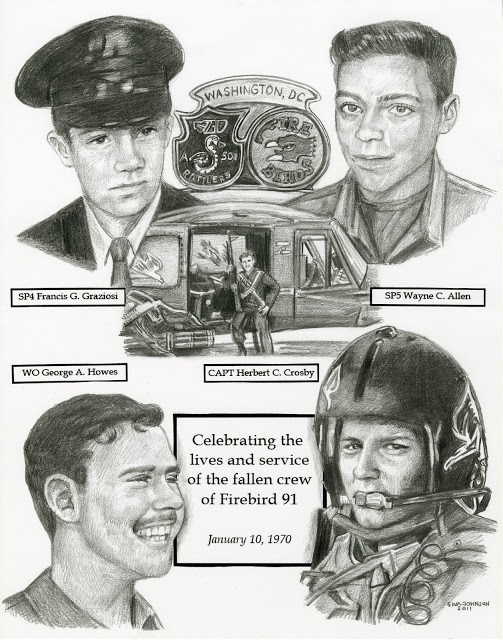 Somewhere on http://www.firebird91.org I have a photo of the beautiful embroidery remembrance your chapter gave our family that was placed on a gold easel in the Fort Myer Chapel. It hangs on the wall with other memorabilia of his, I’m looking at it as I write this message. Thank you so very much for what you do and remembering Herby. I miss him dearly every day, and I honor him, along with all the POW/MIAs, always. I’m a member of his comrades Association (Rattler-Firebird.org). We meet every other year. They tell me stories of my brother, and are now my brothers. Two are former Hanoi Hilton POWs, dear friends. I lost a brother but he left a gift, a whole company of helicopter pilots who are now my brothers. I am so overwhelmed to find all this. When I was a child, I too wore a bracelet for Capt. Crosby. I never took it off, and it finally cracked and broke apart, and I don’t know what happened to the pieces. But I never forgot his name. Now, nearly half a century later, it occurred to me to check on the internet…wow, just wow. Sending you love across the years, Marylou. I found your website as I was trying to locate Herby’s grave in ANC. My son Gabe and I had the honor of visiting and paying our respects today. That’s a beautiful spot and befitting our hometown hero. I shared Herby’s story with Gabe. I’m from Donalsonville and left in ’80 to join the Air Force but I still remember when Herby went missing and the concern our whole community had for him and your family. As a parent and a brother, I can’t imagine what you went through. As a career military man I have the highest measure of gratitude for the sacrifice that Herby and your family have made. We’re all grateful that he’s home and salute you for keeping his legacy alive. I remember you from high school. You were a senior and majorette as I was just getting into the band. In those days Mr Strickland let us move up in 6th or 7th grade. I remember your older sister Janie too. I dont think I ever met Herby but i knew your mom and dad. I remember Mrs. Jane’s little art building beside your house. I loved to hear her talk. I got to know Mr Herb fairly well when he had the sporting goods store by the old Tastee Freeze. He was a great guy! That all seems like yesterday. Thank you Jack. It’s always wonderful to get a message from someone who knew our family. I don’t remember you, but will look you up. And thank you for sharing Herby’s story with your son as it’s something special. And, thank you for your service to our country, means more than I can express. I do everything I can to keep Herby’s legacy alive. He’s missed for sure. I visit him as often as I can at plot 557 in Section 60. Mom and Dad are both gone now, and none of the family lives in Donalsonville anymore, yet I visit when I can. They’ve taken a huge hit with the hurricane that plowed through there. God bless you and your family. Hi my Name is Brandon Dobbins from Columbus Ohio I have a POW/MIA Bracelet Capt Herbert C Crosby just wanted to say it brings smile and tears to my face … to say Welcome home sir and God Bless you all and the men of Firebird of 91 ! God Bless America.. Thank you for your service! Your support is one of the reasons why my brother’s remains were identified. You cared enough to wear a bracelet, supporting the cause to never give up hope on accountability for our POWs and MIAs. Thank you Brandon. God bless you, and yours, and America.